Traditionally used in the production of Norwegian Farmhouse Ale. 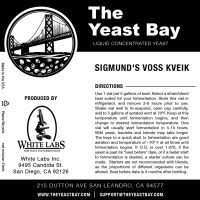 Sigmund’s Voss Kveik yeast is a single strain of Saccharomyces cerevisiae isolated from a sample of kveik generously provided by Sigmund Gjernes via Lars Garshol (click here for Lars’ blog). Traditionally used in the production of Norwegian Farmhouse Ale, this strain is a fast fermenter with good attenuation, a light earthy spiciness, marked tartness and unique ester profile of orange peel. This strain is prone to forming incredibly large flocs unlike any other yeast we’ve seen before, yet still remains highly attenuative. Sigmund’s Voss Kveik also exhibits the ability to ferment wort over a large temperature range, 70 – 100 ºF, without major changes to the flavour profile or production of any harsh phenolics or fusel alcohols.